4029 1944 Laser Hot Hits. Martin Scott show. Ad for FSN, then "Gloria" Laura Brannigan. SINPO 54444. 6210 1920 Radio Borderhunter. "Amadeus" Falco then Kiss "I Was Made for loving You." SINPO 54444. 6280 1950 Radio Caroline North relay (via Merlin). "Boys of Summer" Don Henley, ID. SINPO 34333. 6305 1937 Radio Kleinezender. Dutch music. SINPO 24332. 4029 1842 Laser Hot Hits. Mike Andrews show. Peter Gabriel "Red Rain," Bryan Ferry "Avalon." SINPO 54444. 6205 0812 Horizon FM. "I Wouldn't Change A Thing About You," then Jackson 5 "I Want You Back." SINPO 34333. 6240 1615 Radio Kilohertz. ID, talk in German, German schlager. SINPO 44433. 6245 1547 Voice of the Netherlands. Pink Floyd "The Wall," Coldplay "Rule the World," ID, talk about antenna problems. SINPO 54444. 6286 0817 Radio Focus Int. The Who "You'd Better You Bet." SINPO 34333. 6297 1830 Odynn Radio. "Running With the Devil," "I Can't Stand the Rain." SINPO 44433. 6300 1535 Radio Pluto. ID, "Didn't I See You Crying," talk in Dutch, Queen "It's A Kind of Magic." SINPO 34333. 6383 1813 Radio Zeewolf. Greetings, using 20W, Bee Gees "Jive Talking." SINPO 44333. 6450 1510 Studio 52. Dutch music, ID jingle. SINPO 44433. 6955 0804 Radio Coax. Oldies, weak signal. SINPO 24332. 9510 0925 Radio Caroline anniversary programme v IRRS. Special edition of the "16 Gwendoline Street" show with recordings from Caroline. SINPO 55444. Phil Mitchell commemorates the 50th anniversary of Radio Caroline in short, revealing a special surprise. 3905 2330 Skyline International Radio. Dutch song then Roxette "It Must've Been Love." SINPO 54444. 4029 2345 Laser Hot Hits. Dance mx. SINPO 54444. 6205 2320 Horizon FM. Kenny Loggins "Footloose," ID. SINPO 44433. 6210 2025 Radio Telstar South. "Something Tells Me I'm Into Something Good," talking about offshore stations. SINPO 54444. 6224 2255 Radio Carmen. Toto "Rosanna," Queen/David Bowie "Under Pressure." SINPO 54444. 6243 2300 Radio Underground. Saying "ciao" a lot, Dutch music. SINPO 54444. 6256 2305 Radio Tango Italia. Tango mx. SINPO 44333. 6286 2015 Radio Focus Int. 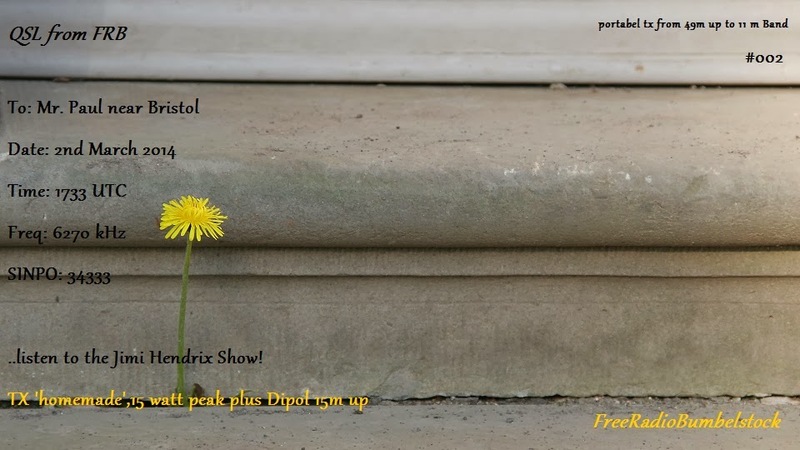 Free, ID, email, then Dr Feelgood "Milk & Alcohol." SINPO 44433. 6295 2010 Radio Rode Adelaar. Instr mx. Signing off. SINPO 54444. 6295 2310 Radio Powerliner. Human League "Human," ID at 2332. SINPO 44433. 6400 2020 Radio Python. Alternative mx, greetings. SINPO 44433. 3905 2120 Radio Calipso. Hall & Oates "Maneater." SINPO 44333. 4029 2130 Laser Hot Hits. Gary Drew with 80s soul & funk. SINPO 54444. 6245 2108 Horizon FM. Chumbawamba "Tubthumping." SINPO 44433. 6286 2056 Radio Focus Int. ID, Marvelettes "When You're Young and In Love." SINPO 54444. 6300 2112 Radio Dakota. ID, greetings, polka. SINPO 44433. 6310 2045 Radio Blackbeard. Dance mx, greetings. SINPO 54444. Fifty years ago tomorrow marks the day Radio Caroline took the airwaves with regular programmes, and changed British radio forever. There's been quite a lot written and on the radio about the anniversary but very little on the TV. I thought we might have even got a documentary. But it seems not to be. 3905 2040 Skyline Radio Int. Dutch music, talk in Dutch. SINPO 44333. 4029 2055 Laser Hot Hits. Ian Lawrence show. Billy Paul "Your Song," Patti Smith & Don Henley. SINPO 54444. 6245 2010 Radio Casanova. Dutch and German songs. SINPO 54444. 6285 1736 Hit Mix Radio. "Baby Love," then Dutch song, some utility QRM. SINPO 43333. 6295 1742 Radio Rode Adelaar. Polka, ID jingle. SINPO 54444. 6295 2045 Radio Blauwe Panter. Fleetwood Mac "Go Your Own Way," inst mx. SINPO 44333. 6383 1805 NMD Radio. Polka, Abba "Does Your Know," ID, greetings, strong peaks. SINPO 44433. 6425 1751 Radio Mi Amigo. "Shake Your Body Down." SINPO 24332. 6735 2034 Cool AM. Sixties music. SINPO 33333. 6915 2027 Premier Radio Int. "Ring My Bell," "Boogie Wonderland," utility splash. SINPO 43433. 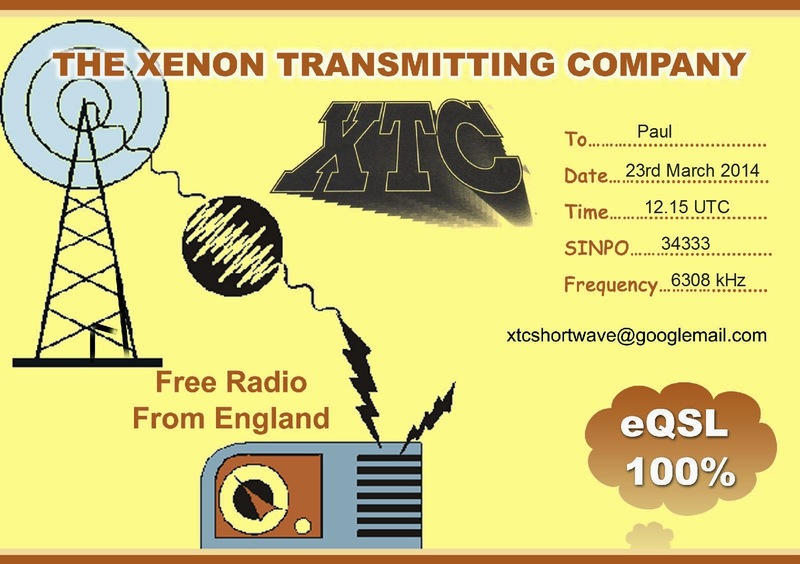 Quick reply from long running UK station XTC who made one of his occasional broadcasts on Sunday. The station has been on the air since 1993. Thanks for the QSL. 6220 2012 Radio Nostalgie. "King of the Road," Prince "1999," using 4W. SINPO 24332. 6295 2057 Radio Blackbeard. Erasure "Give A Little Respect." SINPO 44433. 6300 2022 Radio Verona. Dutch songs. SINPO 44433. 6400 2004 Radio Night Pirate. Techno mx. SINPO 54444. 6400 2033 Radio Ronex. QSO with Night Pirate. SINPO 44433. 6400 2052 Radio Dakota. QSO, now utility QRM. SINPO 43433. I've put a few more recordings up on the Box.com widget on the right hand side, below the time map. The latest, from the end of last year, are Radio Driland, Trans Universe Radio, Radio Jingle Bells, Radio Face de Blatte and Shortwave Rock. 6205 0926 Radio King SW. Oldies. SINPO 34333. 6210 1830 Radio Telstar South. Sixties mx "Young Love," "I Kissed Her." SINPO 54444. 6220 1759 Radio Joey. Dutch song, closing down. SINPO 34333. 6220 1819 Radio De Kleinezender. Pop. SINPO 33333. 6240 1033 Radio Flying Dutchman. David Bowie "Let's Dance." SINPO 44433. 6245 1756 Radio Casanova. ID, email, Dutch song. SINPO 54444. 6265 0907 Radio Nora. ID, instr mx, QSO. SINPO 44433. 6265 0915 Radio Night Pirate. QSO Nora. SINPO 44433. 6265 0910 Radio Ronex. QSO Nora, Night Pirate. SINPO 34333. 6275 0948 Radio Groenteboertje. Dutch songs. Very strong. SINPO 54444. 6285 1751 Radio Silverback. "Jolene," "Last Train From Memphis." SINPO 44433. 6300 1018 Skyline Radio Germany. ID jingle, rock. SINPO 44433. 6300 1117 Radio Verona. Dutch songs. SINPO 34333. 6305 1748 Hit Mix Radio (Radio Tina). Dance & pop, talk German. SINPO 54444. 6305 1855 Radio Ascona. Beach Boys, then Dutch song. Testing new transmitter. SINPO 44333. 6308 1150 XTC. Alternative mx and chat. SINPO 34333. 6325 0910 Radio Norton. Dutch music. SINPO 34333. 6388 1850 Radio Altrex. Dance mx. SINPO 44433. 6400 1013 Radio Verona. Polka. SINPO 44433. 6725 0954 Tower Radio. Dutch songs. SINPO 54444. 6725 1805 Cool AM. Blues mx, some SSB QRM. SINPO 33333. 6803 1131 Radio Pink Panther. Feargal Sharkey "A Good Heart," then "Stars on 45." SINPO 44433. 6950 1740 Laser Hot Hits via Radio Blackbeard. Rick Astley song. SINPO 44433. 7300 1023 U Boat 66 Radio. Oldies. Fair peaks. SINPO 24332. 7340 1100 Radio Scotland Int. QSO with Pacman. SINPO 54444. 7340 1106 Radio Pacman. QSO Scotland. SINPO 34333. 7490 1240 Radio Powerliner. Short test, ID, greetings. SINPO 44433. 7730 1910 Sluwe Vos Radio. "Hit the Road Jack," ID, greetings. SINPO 55444. 11401 0941 Radio Waves Int. ID, country mx. SINPO 54444. 12257 0937 WR International. Boney M "Rivers of Babylon." SINPO 34333. 21460 0930 Cupid Radio. Music just audible. SINPO 24332. 3905 1945 Radio Quintus. Greeting Artem, email, Dutch music. SINPO 44433. 4029 1700 Laser Hot Hits. Gary Drew show with soul & funk from 80s. SINPO 44433. 6205 0910 Radio King SW. Soft rock. SINPO 44433. 6210 1941 Radio Goudenster. Dutch songs. SINPO 44433. 6220 2038 Delta Radio. Boney M "Rasputin," jingle. SINPO 44333. 6241 1628 Radio Bonofox. Polka, ID, closing down. SINPO 33333. 6243 2026 Radio Flying Dutchman. Greetings, pop. SINPO 44433. 6265 2012 Radio Python. Alternative mx, moved to avoid bursts of QRM. SINPO 44433. 6268 1935 Radio Odynn. Dire Straits, moved to 6290 at 1936. SINPO 54444. 6280 2015 Radio Python. Move from 6265. SINPO 44433. 6285 1633 Radio Rainbow. "Like A Rainbow," giving out web address, closing down. SINPO 54444. 6289 0900 Radio Experience. Dance mx, off at 0905. SINPO 44433. 6290 1936 Radio Odynn. Move from 6268. SINPO 54444. 6295 2022 Radio Norton. Dutch songs. SINPO 44433. 6300 1714 Radio Rode Adelaar. Polka song "Don't be Blue Anymore." SINPO 54444. 6307 1919 Radio Altrex. Bee Gees "Night Fever," ID jingle. SINPO 34333. 6380 1927 Radio Universe. "I'm So Excited,2 "Red Red Wine." SINPO 54444. 6395 1955 Radio Zodiac. ID, greetings, Heart "Barracuda," Police "Roxanne." SINPO 54444. 6423 2050 Radio Dutchwing. Country music. SINPO 54444. 6747 1640 Radio Pioneer. KLF "Last Train to Transcentral." SINPO 54444. 6803 1645 Radio Pink Panther. Leo Sayer "I Love You More than I Can Say." SINPO 54444. 6910 1951 Premier Radio Int. Fleetwood Mac "Dreams," then off. SINPO 44333. 3905 2038 Radio Alice. Percy Faith Orchestra, then "Marie Maria." SINPO 54444. 4029 2045 Laser Hot Hits. Eagles "Journey of the Sorcerers," mention they're touring again. SINPO 54444. 4705L 2246 Over 60 Degree Radio. Blues mx. SINPO 34433. 6215 2100 ROZ. Sixties music. SINPO 34333. 6240 2300 Radio Ronalisa. Rolling Stones "Paint It Black." SINPO 33333. 6245 2020 Horizon FM. Dave Sherwood show. Robbie Williams "You Know Me." SINPO 54444. 6267 2237 Radio Mustang. Blondie "Heart of Glass," greetings. SINPO 54444. 6285 2114 Radio Goudenster. ID, email, Dutch songs. SINPO 44433. 6300 2252 Radio Paardenkracht. Lou Reed "Walk on the Wild Side." SINPO 44333. 6747U 2027 Over 60 Degree Radio. Relaying Bluemoose Radio with blues mx. SINPO 34433. 6915 2050 Premier Radio. Derek & the Dominoes "Layla." CW QRM on 6917.5. SINPO 43333. 6218 1826 Unid. Elvis "Now or Never," Elvis Presley, then Roy Orbison, ID jingle too quick! SINPO 54444. 6255 1730 Horizon FM. James Blunt, what's on in the Canaries, Fine Young Cannibals. SINPO 33333. 6267 1612 Radio Tina. Mink Deville "Spanish Stroll," ID. SINPO 44433. 6289 1622 Radio Experience. Dire Straits "Sultans of Swing." SINPO 34333. 6295 1746 Radio Rode Adelaar. Sweet "Dynamite," Golden Earring "Radar Love." SINPO 54444. 6305 1737 Radio Tina. "Days of Pearly Spencer." SINPO 44333. 6307 1820 Radio Deutsche Schallplatten Sender (Radio Tina). "La Bamba", IDs German/English. SINPO 54444. 6325v 1755 VO Ukrainian Crimea. Punk mx, IDs, drifting between 6325-6326. SINPO 34333. 6375 1812 Radio Goofy. ID jingles, oldies. SINPO 33333. 6950 1627 Radio Blackbeard. Dance mx, greetings. SINPO 44433. 4029 2033 Laser Hot Hits. Gary Drew show. Coco Pop "I'm in Love With You." SINPO 54444. 6255 1940 Radio Merlin Int. Tears for Fears "Everyone Wants to Rule the World." SINPO 34333. 6292 1935 Radio Python. ID, greetings, alternative music. SINPO 44433. 6292 2100 Radio Experience. Oldies. SINPO 44333. 6305 2130 Radio Etherfreak. Instr rock mx. SINPO 34333. 6950 2050 Radio Blackbeard. Dance mx. SINPO 54444. A pirate radio station based from a suburban terrace in Stonecot [Sutton, Surrey] was shut down in a raid this morning (Tuesday). Police and officers from communications regulator Ofcom swooped on the house in Morley Road today. They found a PC hooked up to a tool called a link transmitter that allowed users to convert an internet signal into a radio signal. The person who set up the system was using the kit to broadcast FM radio via a link to an aerial on the top of Chaucer House in Central Sutton. It is believed the person who set up the system was charging DJs to let them broadcast via it. Officers shut down the system and seized the equipment from both the house and the top of Chaucer House. No-one was arrested. 4029 2015 Laser Hot Hits. Cliff Richard & Phil Everley "She Means Nothing To Me," Propaganda "Duel." SINPO 44433. 6290 2020 Supersound Radio. ID jingle/email, oldies. SINPO 54444. 6305 2000 Radio Verona. Dutch music. SINPO 44433. 6375 2010 Radio Caroline-Rainbow. "Stars on 45." SINPO 44433. 4029 1834 Laser Hot Hits. Mighty Wah "Story of the Blues." SINPO 54444. 6205 0938 Radio King Shortwave. Oldies. SINPO 34333. 6210 1825 Radio Telstar South. Offshore memories, 60s music. SINPO 54444. 6220 1637 Radio Tina & Telstar Radio. Schlager, ID, said closing down. SINPO 44433. 6220 1745 Radio Onda Caliente. Oldies. SINPO 44433. 6240 1723 Voice of the World Radio. Now on this frequency. "Don't Leave This Way." SINPO 54444. 6240 1817 Radio Borderhunter. ID, chat, instr mx, Kraftwerk "Autobahn." SINPO 54444. 6245 1720 Radio Casanova. Toto "Africa", ID, greetings. SINPO 54444. 6250 1552 Voice of the World Radio. ID, talk in Dutch & English, Billy Joel "Uptown Girl." SINPO 54444. 6255 0930 Horizon FM. Miley Cyrus "Wrecking Ball." SINPO 24332. 6265 1752 Sundown Radio. "Give Me the Night", testing new mic, voice audio on low side. SINPO 44433. 6285 0923 Radio Pluto. ID jingle. Dance music. SINPO 34333. 6290 1651 Radio Ronex. Kim Wilde "Cambodia," electro mx. SINPO 54444. 6290 1748 Radio Foxfire. ID jingle, OMD. SINPO 34333. 6300 1616 Radio Blauwe Panter (tent). "Candle in the Wind," "Tubular Bells." SINPO 44433. 6300 1700 Radio Rode Adelaar. Polka. SINPO 54444. 6324 1657 Odynn Radio. Dutch songs, ID jingle. SINPO 44433. 6375 1610 Telstar Radio. Dutch mx. SINPO 44433. 6394 1601 Radio Lowland. Report to Radio Underground, Toto "Africa." SINPO 44333. 6745 1702 Radio Mustang. Golden Earring "Radar Love," greetings, very strong. SINPO 54444. 6803 1648 Radio Pink Panther. Elton John "Nikita," whistle from carrier on 6800. SINPO 54444. 6925 1802 Over 60 Degree Radio. Relay of Artem's World Radio Show. SINPO 24332. 6950 1628 Radio Blackbeard. Dance version of "Going Back to My Roots." SINPO 54444. 9510 0950 Radio City v IRRS. Blues mx. SINPO 55444. 13915L 1714 Baltic Sea Radio. "Happiness Is", good but audio not as crisp as usual. SINPO 44433. 3905 2030 Skyline International Radio. Schlager. SINPO 54444. 4029 2022 Laser Hot Hits. Move to avoid strong utility, Ian Lawrence show. Chris Farlowe "Out of Time," ads, jingle, Cliff Richard song. SINPO 54444. 6255 2007 Horizon FM. "Another Night," jingle, then REM "Imitation of Love." SINPO 44433. 6265 2012 Radio Tango Italia. Tango mx. SINPO 44433. 6324 2016 Radio Underground. Greeting listeners, ambient mx. SINPO 54444. NDL has for several years been thinking about a DX listener contest - and now is the time. Listen to as many pirate stations as possible. Send reports and count the responses received. The competition is primarily designed for the Scandinavian countries, but also participants from other countries are welcome. For the Nordic participants apply the competition as SM and NM, individually and in teams. Easter is one of those times of year that pirate radio transmissions are most intense. 4015 2140 Radio Blackbeard. Dance mx. SINPO 34333. 4025 2128 Laser Hot Hits. Paul Stuart reading emails, Quincy Jones song, utility splash. SINPO 42332. 6240 1757 Radio Ronalisa. "Venus," greetings, "Morning Has Broken." SINPO 34333. 6255 2145 Horizon FM. James Blunt song, "Horizon FM - Tenerife's better music" jingle. SINPO 54444. 6285 1804 Radio Rode Adelaar. Polka, ID in Dutch. SINPO 54444. 6300 1808 Wizard Radio. ID, Kraftwerk, calling for QSO. SINPO 34333. The following Relays are on the air this weekend. Radio City will be on the air Friday March 14th on 7290 kHz via IRRS from Romania with 150 KW, and via Challenger Radio, Italy on 1368 kHz at 19.00 to 20.00 UTC with 10 KW. Radio City will also have a repeat Transmission on Saturday February 15th between 09.00 to 10.00 UTC on 9510 kHz. There is also the weekly transmission via Radio Mercurs in Riga, Latvia on 1485 kHz on Saturday evenings at 20.00 to 21.00 UTC. Please send all reports to: citymorecars@yahoo.ca Thank you! Every Saturday and Wednesday the programs of HLR. 6240 2017 Radio Foxfire. Sweet "Hellraiser," ID jingle, then "Johnny Remember Me," some QRM noise. SINPO 33333. QSL received from Andy who says station now using 6245 kHz. 6220 1959 Radio Python. Alternative music. SINPO 44433. 6402 1946 Radio Black Arrow. Journey "Don't Stop Believing." SINPO 54444. 6803 1944 Radio Pink Panther. ID jingle, Dutch song, some utility QRM. SINPO 43433. 4895 1739 U Boat 66 Radio. ID jingle, greetings, oldies. SINPO 34333. 6200 0955 Radio Technical Man. Dutch music, talk in Dutch. SINPO 54444. 6220 1011 Radio Flying Dutchman. "Lady Belinda," ID jingle and off. SINPO 44433. 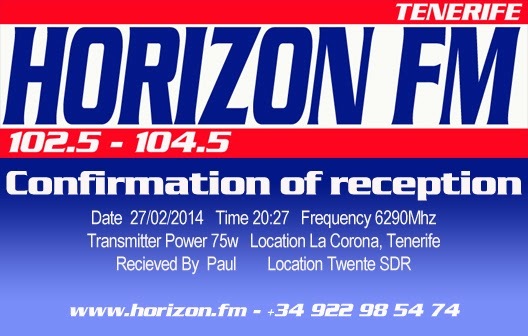 6245 1725 Horizon FM Tenerife. Back on after two week break, top 40 shows and local ads. SINPO 34333. 6250 1007 Cupid Radio. ID, greetings, rock music. SINPO 54444. 6265 0940 Radio Nora. Talk about good weather, in QSO. SINPO 44433. 6265 0945 Radio Scotland Int. QSO with Nora and others. SINPO 54444. 6265 0952 NMD Radio. Also part of QSO. SINPO 44433. 6265 1755 Radio Telstar. Dutch song, polka, ID. SINPO 54444. 6275 1541 Radio Python. "Crocketts Theme", ID and off before returning for QSO. SINPO 33333. 6278 1056 VOTN. Dance music. Moved to 6276 at 1100. SINPO 44433. 6285 1655 Radio Tango Italia. Tango mx. SINPO 34333. 6287 0948 Radio Altrex. ID, sixties mx. SINPO 24332. 6305 1047 Radio Marabu. Del Shannon, talk in German. SINPO 44433. 6325 1715 Radio Joey. Soft rock, greetings. SINPO 34333. 6389 1428 Radio Rob. Visage "Fade to Grey," ID jingles, best in narrow filter to avoid utility. SINPO 34333. 6803 1442 Pink Panther Radio. "Mexico," then "Love You To Want Me." SINPO 54444. 6910 1106 Premier Radio Int. Gerry Rafferty "Baker Street." SINPO 24332. 6950 1335 Laser Hot Hits v Blackbeard. Paul Stuart show. Lionel Ritchie, OMD. SINPO 34333. 6975 1800 Radio Pluto. "Rio," then slow song. SINPO 34333. On 6970 at 1817. SINPO 44333. 7425 1016 Skyline Radio Germany. IDs, music, fair peaks. SINPO 24332. 7480 0935 Radio Thunderbird. Talk in German, electro mx. SINPO 44433. 12257 1020 WR International. ELO "Mr Blue Sky." Good signal with strong peaks. SINPO 44433. 6205 0926 Radio King SW. "Highway 61," ID jingle. SINPO 44433. 6210 1837 Radio Telstar South. "Without Love," talk about offshore stations. SINPO 54444. 6240 1745 Radio Ronalisa. Move from 6975. "Rivers of Babylon," polka, ID. SINPO 34333. 6282 1753 Radio AC DC. "Eye of the Tiger," "Rawhide," ID, email. SINPO 54444. 6295 1716 Radio Mustang. Shadows "Apache," also on 6910. SINPO 54444. 6300 0939 Radio Scotland Int. QSO VOTN, said off to work in garden. SINPO 54444. 6300 1242 Radio Caroline. Relay from the station's 50th anniversary birthday party in Rochester, Kent. SINPO 44433. 6305 0920 Voice of the Netherlands. Pink Floyd "Comfortably Numb," SINPO 54444. 6305 1300 Radio Marabu. Santana, Womack & Womack. SINPO 44433. 6325 1900 Radio Norton. Dutch songs, some utility QRM. SINPO 43333. 6393 1505 Radio Baken 16. "Stars on 45" then Madness "One Step Beyond," ID, greetings. SINPO 44433. 6450 1844 Studio 52. ID, instr. mx, ID, Dutch song. SINPO 44333. 6747 1454 Radio Pioneer. German version of "Que Sera Sera" then "Lay Back in the Arms of Someone." SINPO 44433. 6803 0950 Radio Pink Panther, "It Feels Like I'm in Love," then some Dutch songs. SINPO 44433. 6815 1736 Sundown Radio. ID, email add, instr mx. SINPO 54444. 6910 1714 Mustang Radio. "Wild Thing," also on 6295. SINPO 54444. 6915 0942 Radio Tidalwave. Greetings, ID, Booker T "Time is Tight." SINPO 54444. 6920 1704 Trans Europe Radio. "Heaven Must Be Missing An Angel," "Rock Your Baby." SINPO 54444. 6930 0905 Radio Altrex. Dance mx, ID jingle "Rose Garden." SINPO 34333. 6950 1442 Radio Blackbeard. ID, email, dance mx. SINPO 34333. 6960 0932 Radio Altrex. Move from 6930. T Rex. SINPO 34333. 6975 0915 Radio Ronalisa. ID, ballad, signing off. SINPO 44433. Back at 1730. SINPO 44433. 6240 1750 Radio Ronalisa. ID, greetings, Scorpions "Winds of Change," testing new antenna. SINPO 34333. 6255 1800 Radio Tango Italia. ID, tango music. SINPO 34333. 6285 1724 Long Live Radio. ID, Rammstein. SINPO 34333. 6295 1708 Hit Mix Radio. Bee Gees, ID, Bellamy Brothers "Let Your Love Flow." SINPO 44433. 6747 1703 Radio Pioneer. Technotronic "Pump Up the Jam." SINPO 54444. 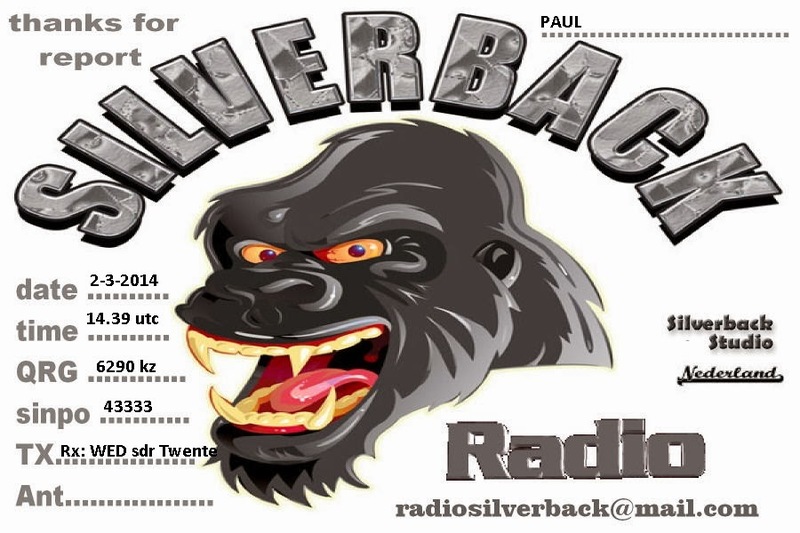 Thanks, Radio Silverback for the QSL. 6240 1743 Radio Casanova. Sixties music, greetings. SINPO 44433. 6285 1951 Radio Etherfreak. ID, oldies, greetings. SINPO 34333. 6290 1735 Cupid Radio. Dance mx, ID, ELO. SINPO 54444. 6325 1720 Radio Norton. Dutch songs. SINPO 34333. 6400L 1942 Over 60 Degree Radio. Relay of Radio Merlin. J Geils Band "Centrefold." SINPO 34433. Message on the Radio Merlin Facebook page: "Now for some sad news due to the fact that someone has reported our TX site, and are still at the TX site Radio Merlin has been forced to close down .Thank you to all our listeners over the years bye bye from all of us at Radio Merlin International .We will still be on live from our web site every other sunday with live shows .paul watt 73." 6295 1858 Radio Altrex. Oldies, jingle IDs and moo sounds, Roxette "She's Got the Look," some by utility QRM. SINPO 3333. 6802L 1756 Radio Mistero Ghost Planet. Special tribute programme to Lucio Dalla, greeting listeners. SINPO 34433. With radio stations in New Zealand falling over one another to out-shock, out-trash and out-rate each other, it's nice to remember that once upon a time it wasn't like that. No, I'm not talking about a century ago, before the advent of broadcast radio. I'm referring to the glory days of Radio Hauraki, when a bunch of hard case larrikins took the bull by the horns and launched a pirate radio station to play rock'n'roll instead of state radio's easy-listening pulp. A new feature film, 3 Mile Limit, by first-time director Craig Newland, celebrates the unlikely heroes of Hauraki, depicting the genesis of a crazy idea and the antics that ensured it didn't just remain on the mixing board or get washed out to sea. On a broader scale, it's a joyful "kicking against the pricks" , "she' ll be right, mate", "number eight wire", "all for one, one for all" tale of triumph over mediocrity. But at its heart, "3 Mile Limit" is about the lengths Richard Davis (Matt Whelan) will go to establish his illegal station and the limits of his wife Judy's (Belinda Crawley) patience as he drives them out of house and home to fund his dream. 6285 1815 Radio MIR. Talking about Russia and Ukraine, calling for all stations and listeners to join Pirates for Peace (piratesforpeace.tk), Nicole "A Little Peace." SINPO 54444. 6300 1806 Wizard Radio. QSO, said using inverted V antenna. SINPO 34333. 6300 1809 Radio Ronalisa. QSO with Wizard. SINPO 34333. Quick reply from German free radio station Radio Free Bumbelstock with a QSL for report sent yesterday. Thanks very much. 6210 0939 Skyline Radio Germany. Weak signal, music. SINPO 24332. 6210 1449 Time Radio. Jim Reeves, jingle. SINPO 44433. 6245 0908 Radio AC DC. Eagles "Take It Easy." SINPO 44433. 6250 1036 Radio MIR. Recorded message telling Russia not to attack Ukraine. SINPO 44433. 6270 1732 Free Radio Bumbelstock. Blues rock, ID, said signing off soon. SINPO 24332. 6285 0930 Radio Focus Int. Rolling Stones, ID, SMS number. SINPO 34333. 6290 1434 Radio Silverback. Four Tops "If I Was A Carpenter." SINPO 43333. 6300 0925 Radio Bizon. ID, Peter Gabriel "Sledgehammer." SINPO 34333. 6301 1440 Radio Joey. "Afternoon Delight," "Carry on Wayward Son." SINPO 34333. 6310 1718 Radio Telsar South. The Beatles "Don't Me Down," utility QRM. SINPO 42432. 6390 1011 Radio Zeewolf. QSO Lowland. SINPO 44433. 6391 0944 Radio Lowland. Asking for QSO, "Apache," SINPO 34333. 6393 1508 Radio Baken 16. Madness, Stray Cats, QSO. SINPO 54444. 6393 1515 Radio Tina. ID, greetings, German mx. SINPO 44433. 6395 1526 Radio Rob. QSO Tina, Baken. SINPO 44433. 6402 1428 Radio Boomerang. Cranberries, off 1430. SINPO 54444. 6422 1042 Radio Python. Greetings, alternative music. SINPO 44333. 6803 1503 Radio Pink Panther. German songs. SINPO 54444. 6910 1046 Premier Radio Int. Steve Miller Band "Abracadabra." SINPO 34333. 6975 0951 Radio Ronalisa. German version of "Heartbreak Cafe," Abba "Dancing Queen." SINPO 34333. 7300 0920 U Boat 66 Radio. Whitesnake "Is This Love." SINPO 34333. 7425 0914 Crazy Wave Radio. ID, email, Kansas "Carry on Wayward Son." SINPO 44433. 9485 1000 MV Baltic Radio. New frequency. Sign on English/German. SINPO 55444. 3905 1813 Radio Calipso. ID, instr mx, Status Quo "In the Army Now." SINPO 44433. 6205 0920 Radio King SW. The Doors "Light My Fire." SINPO 44433. 6220 0915 Radio Rode Adelaar. Polka, ID, talk in Dutch, Dutch song. SINPO 44433. 6255 1714 Radio Telstar South. Procul Harem, het from carrier on 6254. SINPO 43333. 6265 1720 Radio Tango Italia. Tango mx. SINPO 34333. 6285 0845 Radio Focus Int. T Rex "20th Century Boy," Oasis "Roll With It." SINPO 44433. 6293 1702 Radio Pluto. Dutch song, IDs. SINPO 44433. 6295 1836 Radio Black Arrow. "Crocketts Theme," calling Wizard. SINPO 54444. 6300 1648 Wizard Radio. Testing, oldies. SINPO 33333. 6301 1820 Radio Zeewolf. QSO with Wizard. SINPO 44433. 6326 1620 Radio Caroline-Rainbow. Oakley & Moroder "Electric Dreams," ID. SINPO 44433. 6725 1629 Tower Radio. ID, instr mx. SINPO 54444. 6747 1633 Radio Pioneer. Dutch songs. SINPO 54444. 6803 0901 Radio Pink Panther. Spanish song. SINPO 54444. 6820 1625 Radio Carmen. Techno, ID/email, overmodulated. SINPO 54443. 6910 1945 Premier Radio Int. Sparks "This Town Ain't Big Enough," ID, Cozy Powell "Dance With the Devil." SINPO 34333. 6945 0910 Radio Coax. Ozzy Osbourne, ID, greetings. SINPO 24332. 13800L 1734 Over 60 Degree Radio. Blues mx. SINPO 34433.